i got over my hangover and joined in the party on koh phangan again for my final night on the island. 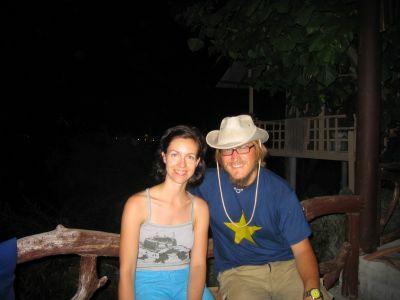 i met dori from berlin at a bar called the escobar in an old treehouse that hung over the ocean. we sauntered over to the warm-up bar to meet the group for the last bash. 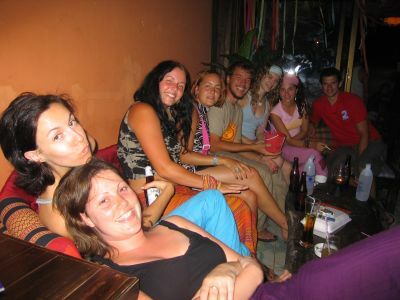 niccola from england, dori, charlotte and camilla from norway, zac, claire from france, sepi and jared from australia. i had to get off koh phangan so i could give my body a break. 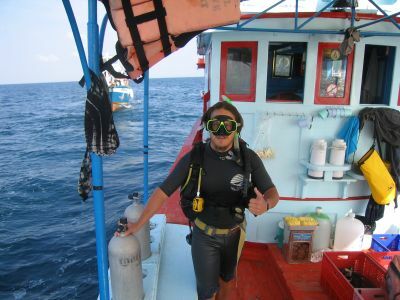 i headed north to koh tao where i took 2 scuba diving classes - the open water and the advanced, to become an advanced scuba diver, authorized to dive to 30 meters. 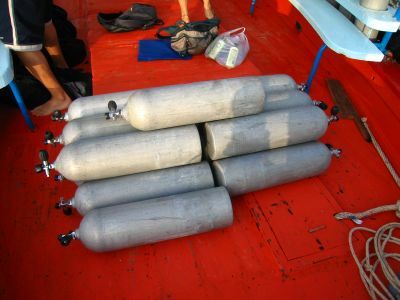 here are some compressed air tanks stacked on the boat for our second dive of the day. here i am on the boat after having just dived "twin peaks" in koh tao, thailand. terry, a lawyer from england, and i were in our first class together so when we both decided to do the advanced course, we became diving "buddies". here we are on top of the dive-boat heading back to shore after a long day of diving. after all the diving was done it was time to party. diving is a very social sport and i met people from all over the world. 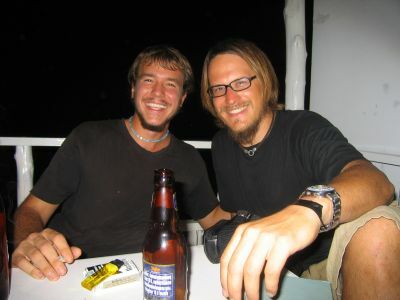 we all would go out to dinner together each night after diving, sometimes needing a table for 17 or more people. great times. 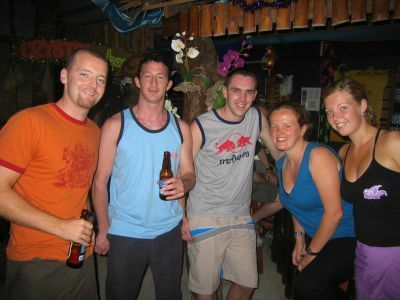 from left to right: val from iceland, jared and owen from ireland, terry, and anna from iceland. i did a lot of diving, eating, drinking, and laughing with these english blokes. 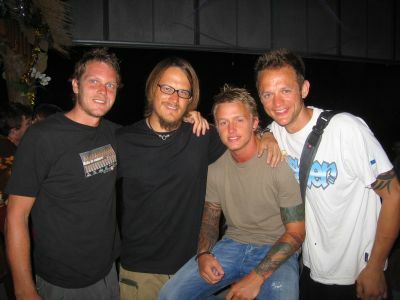 from the left, carl, me, mark, and darren. cheers fellas. 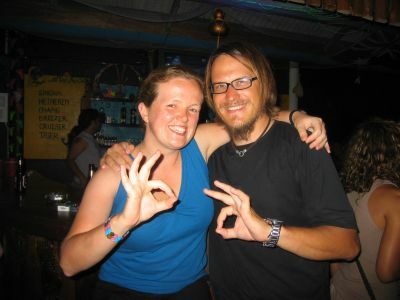 while diving you have to use hand signals to communicate. the thumbs-up, which on the ground means "cool" or "great", means "let's surface" in the ocean, so you have to use the "ok" signal when something is cool. here we are telling anyone looking that everything on the surface is cool. 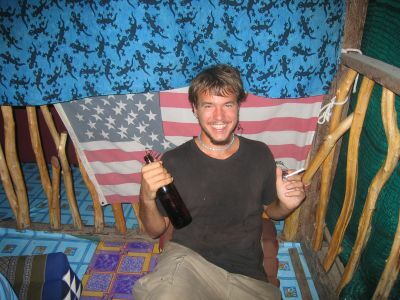 zac, my american traveling partner through malaysia, singapore, indonesia, and australia, finally was able to pull himself away from koh phangan and come to koh tao to meet me. we ran into each other as i was walking down the street with a massive crowd - it's amazing how you can just do that out here. 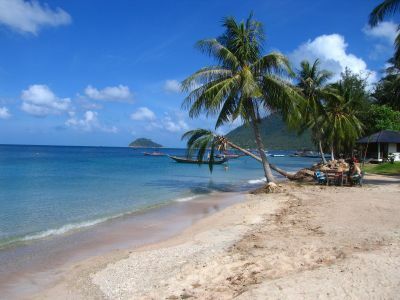 e-mail each other: "come to koh tao and we'll meet each other somehow" and then it happens. here we are at dinner on the night before we left for malaysia. we drifted to another bar after dinner and zac found a spot in front of an american flag. old glory, a cigarette, and a large beer chang - he couldn't get much happier. i was a little tired after a day of diving and a night dive. here i am in a daze at the bar, surrounded by english birds, also divers. the only non-diver on the island was zac. zac and i took a nightboat off the island so we walked around koh tao in the afternoon, did some swimming, exploring, and picture-taking. here is the beach in front of crystal dive resorts where i got my diving certification.